What are the advantages to Beeswax? Beeswax is produced by the honey bees from special glands in their bodies. 2. Long Lasting. Among natural waxes, beeswax candles burn the longest. 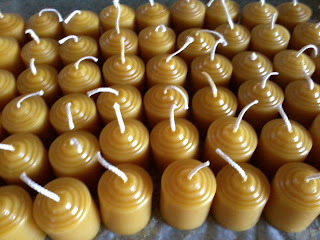 Beeswax is a softer wax, but has the highest melting point causing it to last longer than other candles. 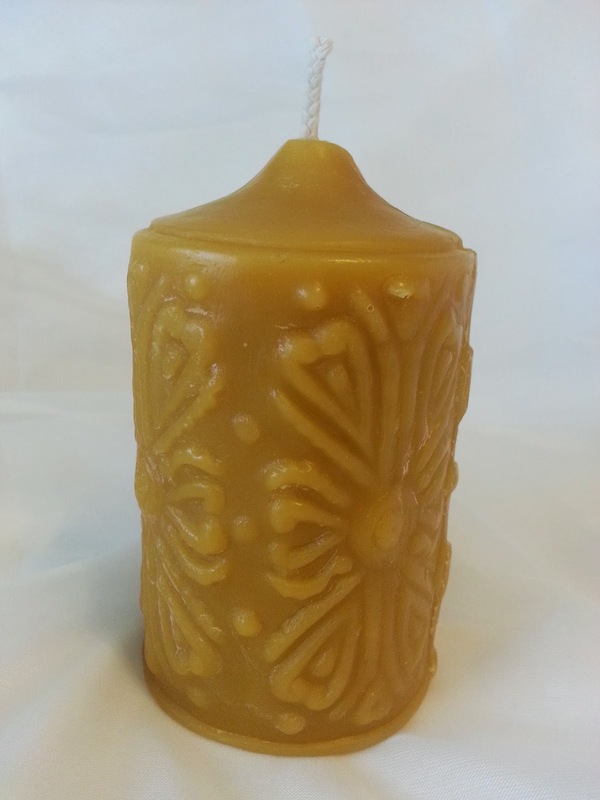 Beeswax burns cleaner and leaves less residue in the air. 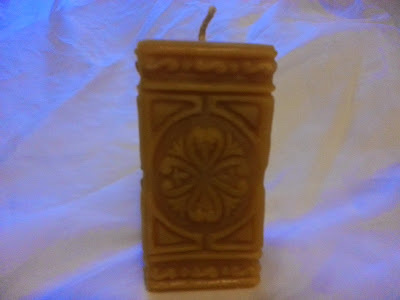 Not only do beeswax candles burn cleaner, they also work like an air filter by producing negative ions which connect to dust in the air and cause it to fall from the air. These votive candles work great for special events. The ones pictured were made for a wedding where they were well received. 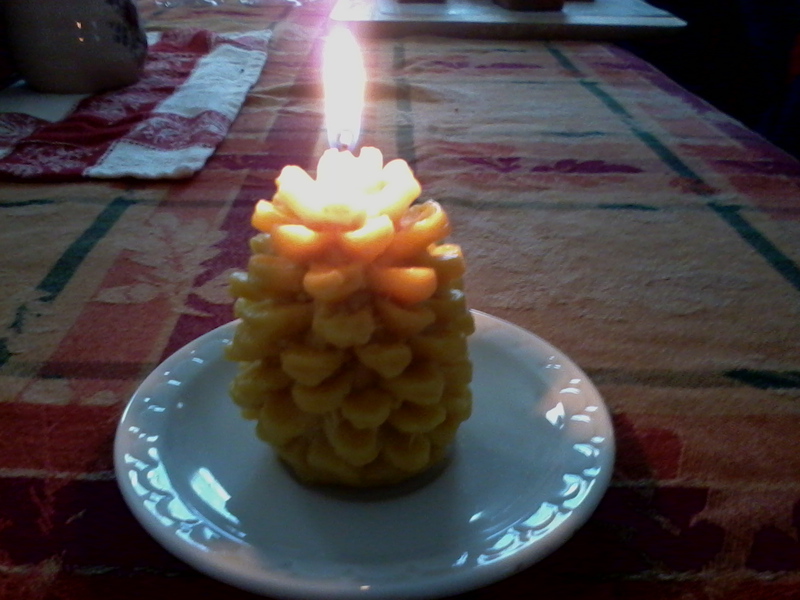 Pine cone votives are also available down below. Bears are a nuisance to honey bees, but it's hard not to like this little bear! one is about 3.5 inches, the medium 5 inches, and the large 6.5 inches. Here's an old fashioned lighthouse ready to burn bright! This candle has some character. On side shows a bear and the other show a running deer. The top shows little rings like as if the candle is a tree stump. This is one big squirrel! Around 6.5 inches at the tip of his tail! He stands around 5.75 in. and weighs over 6 oz. Votive pine cone $1.00 USD Small pine cone $3.00 USD Pillar pine cone $10.00 USD Brighten Up Your Day! Brighten Up the Day of Your Friends! The beeswax pine cone candles are among my most popular candles. These are among the most interesting ones to burn because of the petals melting and breaking away as they burn. Because of the structure of the smaller candles they do tend to drip a lot, so make sure to keep a candle plate that will hold the melted wax. People love these candles! This candle is very unque. It stands 4.5 inches and weighs about 13 oz. Like the other pillars offered here it burns for many hours. Another beautiful and long lasting pillar candle that matches good with the sqaure candle above. Great for candlelight dinners. They can burn over 10 hours each! This candle fits well in most taper candle holders because of its tapered bottom.